I’ve been wearing my natural hair straight more often recently. My straight hair calls for a totally different routine than the one I would use for my hair when it is shrunken and curly. My main objective for my straight hair is to keep it looking fresh while maintaining moisture levels. Some naturals find this hard because our hair can revert back to curly so easily. Hair that is moisturized looks and feels so much better after using direct heat. I still moisturize and seal my hair while it’s straight but I’m also aware that starting the straightening process with a moisture based deep condition is key. I also use grapeseed oil to seal in the moisture from my leave-in conditioner prior to air drying, roller setting or blow drying my hair. Ever since I added the grapeseed oil to my flat ironing regimen, I have noticed that my hair feels softer and more supple after straightening. 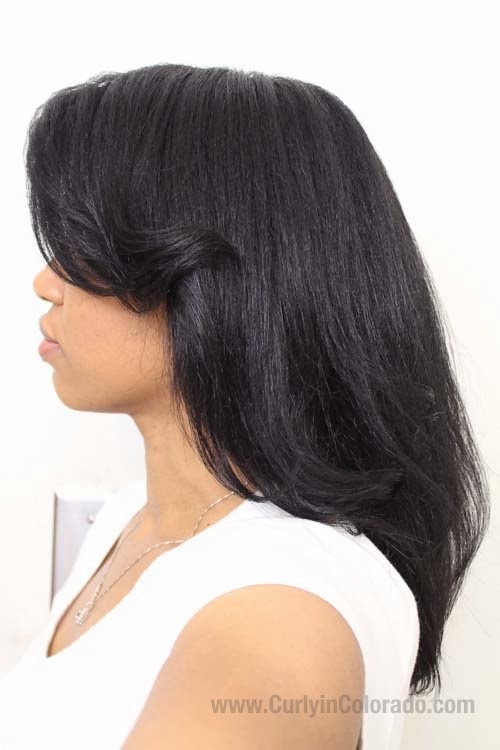 The oil also helps to give my hair a smoother finish without having to use extremely high temperatures. Once my hair is straight, I continue to moisturize it using a leave-in conditioner. I’m currently using Herbal Essence Touchably Smooth Split End Protector*. The trick here is to use just a little bit so that it doesn’t wet my hair. I split my hair into two sections and then apply a dime size amount (or less) to one section. I then use two to three drops of grapeseed oil to seal in the moisture. I don’t have to do this every day that my hair is straight because the oil does such a great job of locking the moisture in. When I want to keep my hair really straight I just wrap it and then wear a wig cap to keep my wrap down tight. I used to use a satin scarf but it kept coming off at night. In the morning I just comb my hair down with a wide tooth comb and go. If I have curls in my hair then I do five or six large pin curls and go to sleep with a satin bonnet or scarf. The next day, all I have to do is take the pins out and finger comb my curls. My straight natural hair isn’t perfect though. I still get fuzzy edges from when water seeps in underneath the edge of my shower cap. My nape area also tends to revert back way before wash day but I’ve learned to just live with it. I usually wear it straight for about a week but would like to start stretching that to two weeks in the future. *Formerly and currently known as the Long Term Relationship Split End Defense Cream depending on which packaging is available. After spending several months wearing heat free styles, I decided to wear my hair straight for a few weeks. A couple of months ago, straightening my hair seemed silly because I would only get to wear the style for a short period of time. 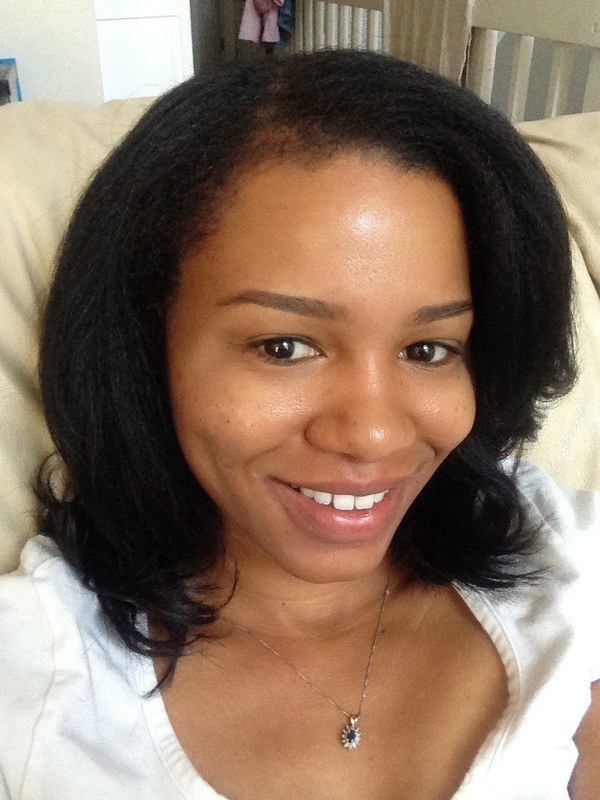 My psoriasis was in high gear so my scalp needed attention every couple of days. This meant cleansing my hair and scalp multiple times each week. At the time, it seemed necessary because my scalp was sometimes unbearable and had to be dealt with. Once my psoriasis calmed down, I decided that I would finally straighten my hair. Wearing my hair straight during the summer heat may also sound silly but I can get away with it here. In Colorado we have a very dry climate so there is little to no humidity on most days. 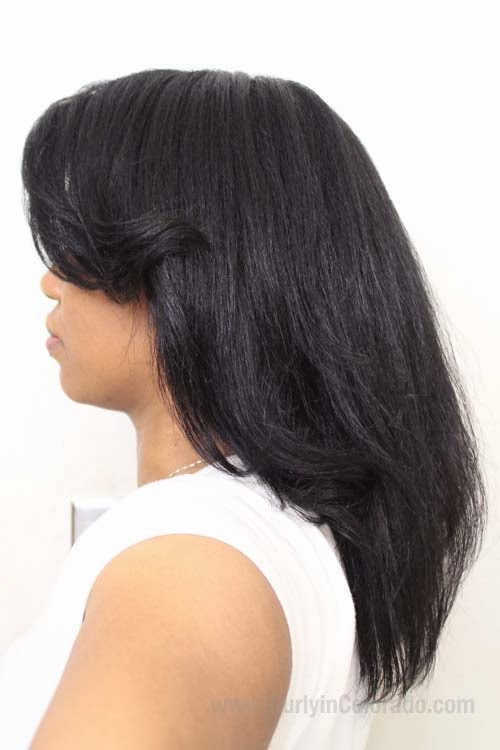 Still, reversion is always possible with straight natural hair. I have been hearing about the Beautiful Textures Texture Manageability System or TMS. This product claims that you can use it on natural hair to help with straight styles over a 4-6 week period. After a few weeks and multiple washes, the hair will supposedly return to its natural state. Well, after reading this article by The Natural Haven blog I’m not so sure. The article gives a breakdown of what happens to the hair structure when using the product. It appears as though the hair bonds are effected but not permanently broken. So yes, the hair does return to a textured state after using the product. However, the product also seems to slightly change the protein bonds. This makes me wonder what would happen after using it multiple times. It would be nice to have straight natural hair that lasts longer but I think I’ll stick to my current routine. I use several heat protectants including grapeseed oil, IC Fantasia’s Heat Protectant serum and Tresemme’s Heat Tamer Spray. The serum helps to combat reversion while the spray and grapeseed oil protect my hair from heat damage. While it’s straight I use things like Herbal Essences Split End Protector to moisturize and grapeseed oil to seal. I also do either pin curls or wrap my hair at night to preserve the style. When I’m ready to go back to curly, I use Aphogee’s 2 Minute Reconstructor to give my hair a light protein treatment. My curls seem to always bounce back just fine with this routine so why change now? What are your thoughts on the TMS system by Beautiful Textures? Please share below in the comments section. In the natural hair world we always hear about using oils for our hair but I’m beginning to learn more about how they work. I’ve mentioned in recent posts how coconut and olive oils are both light enough to actually penetrate the hair shaft. For this reason, they tend to make great moisturizers but not sealants. It’s important to moisturize the hair and then seal it in with something heavier. In the past, I reached for castor oil to seal with because it has a very thick consistency. However, it left my hair feeling really heavy so I thought I would give grapeseed oil a try. 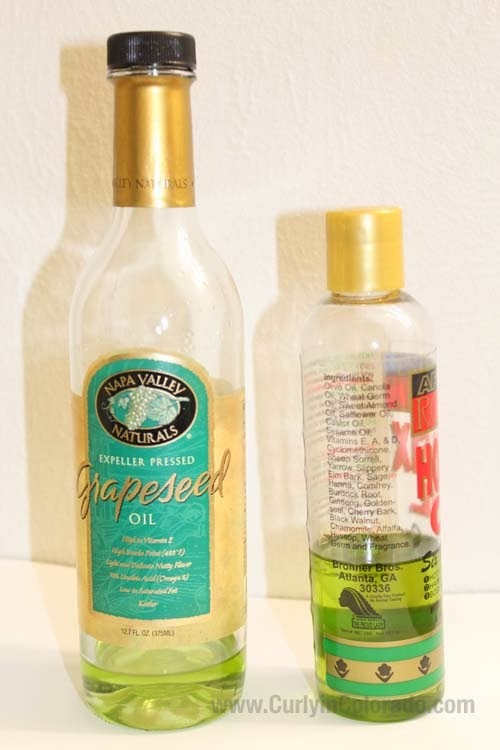 Grapeseed oil is heavy enough to use as a sealant after moisturizing but is lighter than castor oil. An added benefit for me though is that it has a high smoke point meaning I can use it when I use heat on my hair. Now, I’m still not sold on the idea that it can protect against heat damage, but I have noticed a difference. 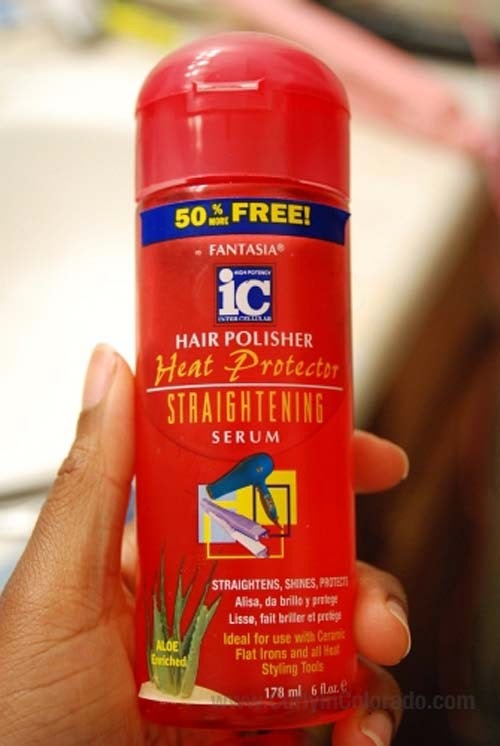 I recently used it when I straightened my hair and I was very happy with the results. Sometimes after heat styling I’m left with hair that is dry and crispy feeling but I didn’t get that when I used the grapeseed oil. 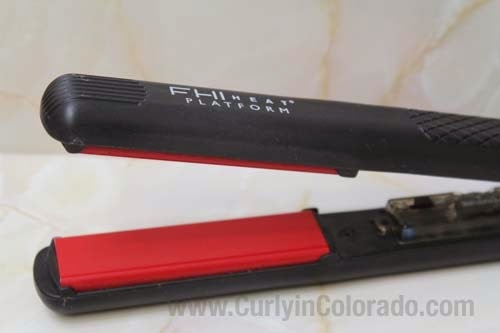 My hair felt very soft and moisturized after using my flat iron on a heat setting ranging from 370 to 400 degrees. The only drawback is that I’ve read that other naturals noticed that their hair reverted quicker after using the grapeseed oil as a heat protectant. For this reason, I also used a silicone based serum by IC Fantasia to help keep my hair straighter longer. I was able to go a full ten days and probably could have gone longer but it was time to cleanse my scalp. I‘ve decided to continue using the grapeseed oil in my hair routine for oil rinses, sealing in moisture and for added protection against heat. I prefer the Napa Valley Naturals brand which I found at a local health food store. If you haven’t tried it I say give it a go! I finally completed my No Heat Challenge which went from October 1, 2013 to February 1, 2014. It may sound crazy but it was the longest that I had gone without using heat since my transition to natural hair. At first, I thought maybe I was going to succumb to the urge to straighten my hair or use a blow dryer. Once I got the hang of styling my hair in other ways, it ended up being easier than I expected. During the challenge I allowed myself the use of my hooded dryer for roller sets and drying my wash n’ go curls. Other than that, I usually just air dried my hair. My favorite styles ended up being braid outs and ponytail roller sets. 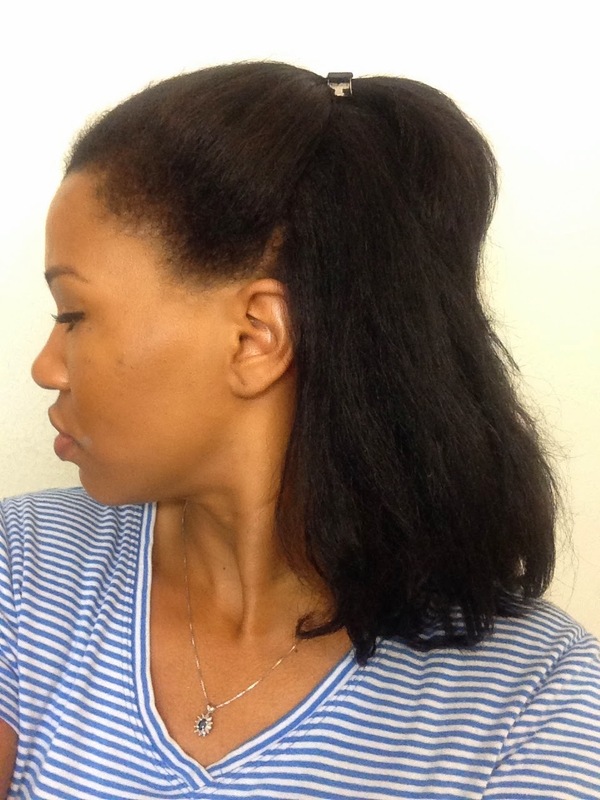 These were easy ways to stretch my hair that also gave my hair manageability. Once the four month challenge was over, I straightened my hair for a length check. I was happy to see that my layers were finally growing out. After flat ironing my hair I decided to give myself a much needed trim. One of the things I noticed though was how many single strand knots I had to cut out. Not good! My thoughts on that were that maybe I should stay away from tightly curly styles until I get to a length where I’m comfortable with just maintaining. For now, I’ll be using stretched styles to try and keep the knots under control. I’ve decided that I’ll probably go another three months before using heat to straighten my hair again. I really liked how the new hair growing in felt so much thicker and healthier. I don’t want to damage it by using excess heat. Overall, I’m pleased with the results and am glad that I challenged myself in this way. I learned a lot about my hair and what it needs, which will help me obtain my goals. Have you ever participated in a hair challenge? I am proud to say that I’m finally coming to the end of my four month No Heat Challenge. The challenge started on October 1st of 2013 and ends on February 1st, 2014. I was able to get through the holiday season without using heat to style my hair. This is a first for me because I’m known for wearing my hair straight for special occasions. This challenge taught me that there are plenty of other styles for when I want something more exciting. In my no heat challenge video I explained that I would be straightening my hair and doing a length check in February. Then I will see if giving my hair a break from the heat resulted in more length retention. Now that the day is fast approaching, I’ve been thinking of ways to fortify my hair so that it will be ready for the heat. 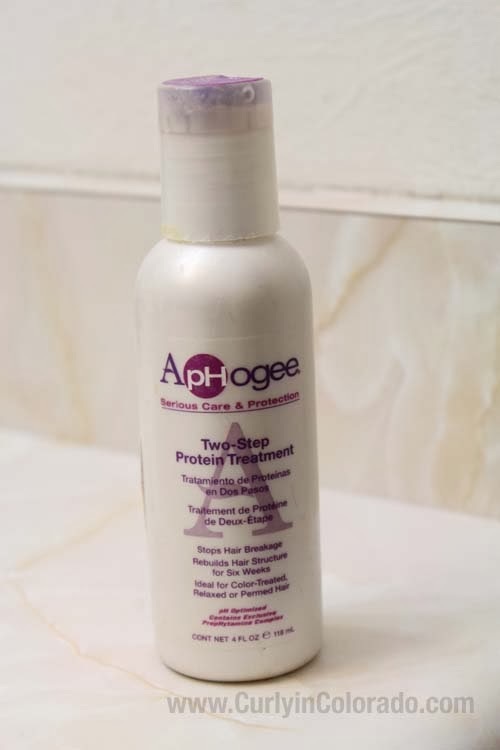 My first thought was to use the Aphogee 2 Step protein treatment because it is known for it’s ability to strengthen the hair. I’ve been experiencing some breakage though so I thought maybe I would address that issue first before doing such a strong treatment. That led me to thinking about some of the things I did in the beginning of my journey when I had fewer problems with my hair. Back then, I used a whipped shea butter mix that I made myself. I was also a huge fan of olive and coconut oils for deep treatments. Another thing I did were deep conditioning treatments one time per week, without fail. Well, my regimen has gotten a little simpler but I think that some of these things were working for me so I’m bringing a few of them back. 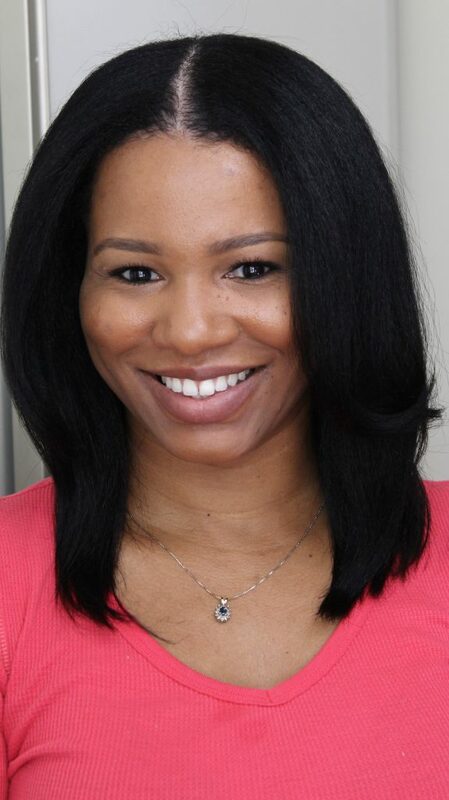 Whenever I had dryness or breakage before, I always did moisturizing deep treatments twice a week until the issue was resolved. After that, I would go back to once per week. In that fashion, I deep conditioned last week using Tresemme Naturals Conditioner, for moisture, under a hooded dryer for about 30 minutes. A few days later, I co-washed and then used the new Aussie 3 Minute Miracle Strong version. I would consider this conditioner a light protein treatment. I wanted to alternate the moisture and protein treatments for balance. Thankfully the Aussie conditioner also gave excellent slip so detangling was a breeze. This week I still may do the Aphogee 2 step treatment but then, the day before straightening, I plan on doing nothing but moisture. 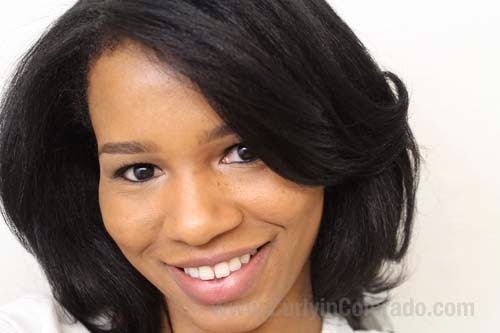 For this, I revisited an old video by Patchouli85 where she explains how to deep condition with coconut oil for moisture and honey for shine. It’s a pre-poo treatment so you end up washing it out before using the heat. The last time I did it my hair was so shiny and soft. That’s exactly what my hair needs. It’s so funny how right now the best thing for my hair is what I started doing at the beginning of my hair journey. I’m just glad that I’m finally getting back on the right track.